Nevisian chefs will have the opportunity to showcase their skills at a new feature added to the Nevis Mango and Food Festival events. The Nevisian Chef Mango Feast, as it is called, will take place on July 12, 2015, at Oualie Beach the same venue of the recent Nevis Blues Festival. Chief Executive Officer of the Nevis Tourism Authority Greg Phillip explained that apart from staging the festival in collaboration with the Department of Agriculture, the authority wants to ensure that local chefs are highlighted along with the other international chefs who are taking part in the month-long event. According to Phillip, the local chefs will have the challenge to create and prepare something that would incorporate mangoes, a fruit that is found in abundance on Nevis. Each chef will have to prepare one item in their area of specialty. The way the Nevisian Chef Mango Feast works is each of the local Nevisian chefs will have a station and you essentially go from station to station and you get to sample and eat what they have prepared. “So chances are, once you come out to that event what you eat at each individual station would be food that you would not have had before and that’s what we want to create, an atmosphere where people are coming out and trying new things,”Â he said. Tickets for the event, which will begin from midday, are on sale for EC $50.00 from the Nevis Tourism Authority and from the St. Kitts and Nevis Hotel and Tourism Association’s The Sands Complex location in Basseterre. Phillip also explained that Barbadian Chef Gregory Austin will also make an appearance. He said Chef Gregory who appears on The Caribbean Cooking Channel’s Five Minute Meals, a television show aired on CNCTV is familiar with St. Kitts and Nevis having worked in the Federation. 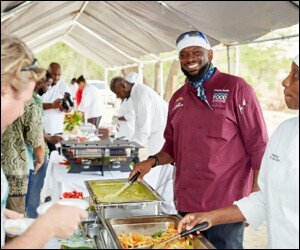 While on Nevis, Chef Gregory will be accompanied by a Caribbean Cooking Channel crew who will film all his appearances during the Nevis Mango Festival, including at the July 10 Mango Madness Street Fair in Charlestown, where the Chef will be doing cooking demonstrations. The Department of Agriculture would also have a presence at the Mango Feast with a number of agro processors who will bring their mango smoothies apart from the other food and drinks, all mango related, that would be available. Meantime, Phillip noted that the Authority has made special arrangements for persons who wish to attend the event from St. Kitts. He said reduced rates had been negotiated with a water taxi from Reggae Beach to the Oualie pier. Patrons only needed to present their tickets to the Nevisian Chef Mango Feast and that would allow them to pay the same price as the regular ferry which operates from Basseterre to Charlestown.